Finkbuilt » Blog Archive » Meteorite or not? When my younger brother and I were kids we used to stay up really late on clear summer nights and lay out on the front lawn and stare up at the stars waiting for meteors. Once in a while we would get lucky and there would be a meteor shower going, or we might just happen to see a few random big ones. I always waited for the one that would come crashing down into the vacant lot next door, or if I was really lucky, through the neighbor’s roof or onto a parked car. But of course, I never got to see one hit. Ever since then I’ve wanted to have a meteorite specimen of my own sitting on my desk for contemplation. I just love the idea of having a chunk of extraterrestrial matter handy. But I’ve never found one. Which brings me to the rock pictured above. Is this a stony meteorite, or just some chunk of volcanic rock? I found this other-worldy looking rock in my yard the other day, and it seemed to have some of that “re-entry” melt texture that I have seen on some meteorites of the metalic variety. But this is not metalic. Still, I was hoping that it might be one of the “stoney” types. So, if any geologists out there happen to see this and can identify my rock, that would rock. While doing a Google search for meteorites, I came accross an interesting kids activity article that described how to collect meteorites in your own back yard. Meteorites are falling all the time, its just that most of them are microscopic and really more “space dust” than meteorites, but they are meteorites nonetheless. To collect your own meteorites, just lay out a big tarp or sheet on your back lawn overnight. After a day or so, run a magnet over the sheet. All of those black specs that stick to the magnet are meteorites. Exciting, huh? This entry was posted on Friday, December 2nd, 2005 at 9:58 pm	and is filed under Debris. You can follow any responses to this entry through the RSS 2.0 feed. Both comments and pings are currently closed. Unfortunately, it’s almost certainly not a meteorite. To quote http://epswww.unm.edu/iom/ident/ (“Do you think you might have found a meteorite?”): “Many people believe that meteorites have the appearance of being molten, perhaps having a frothy appearance or bubbles on their surfaces. However, this is not the case.” Most meteorites are also irregular or fragmentary in shape, not roundish like this. On the plus side, it is likely volcanic in origin, which is pretty cool in itself. This specimen is most likely something like scoria, which can range from reddish all the way to black in color, or vesicular basalt. A Google image search will provide a plethora of examples with which to compare. That’s a nice little nugget of filth you have there, Mr. Lodefizz. Looks kinda like pumice. Does it float? Without actually having in my hand I can’t say what it is. It could possibly be pumice, have you tried putting it in water to see if it floats, or is it very light for its size? Without looking at it, it’s hard to tell, but it could possibly be a “clinker” from a coal furnace. I suppose it could be volcanic too. Do you live in a region that is more likely to have had volcanic activity or coal burning furnaces (for home or industry)? As a professional geologist with over 40 years of field experience, 3 doctorates in geology related sciences, sitting President of the United States Geological Society on Extra-Terresterial Geologic Specimens and as a obsessive-complulsive rock hound I can say without any doubt that this is: a rock. black. looks to be about the size of my fist, or maybe a small melon. would hurt if it fell on your head. That’s my opinion, for what it’s worth. Your welcome. It doesn’t look like a meteorite to me. It looks volcanic to me too. I took a stone that looks similar to the one you have pictured to a geologist at the university I work at last week thinking it was a meteorite. He identified it as limonite and showed me a great many actual meteorites and you really can’t tell a meteorite from an ordinary stone unless you saw it in two and see if it has iron in it. You can also put hydrochloric acid on it and if it fizzes then it is not a meteorite. The big bad atomosphere of Mother Earth has the tendency to burn away any roughness on the surface of incomings like those vesicles in your rock to leave more of a smooth texture. ah, to be vesicular!!! sadly our vesicular friends and playmates are not ET in nature…they form from trapped gas bubbles during volcanism…looks like vesicular basalt to me…not vesicularly enough to be pumice methinks…oh, but only if it were beautifully amygdaloidal…where the vesicles actually fill in with secondary minerals…a much better find and oh so purty-like!! I do belive that is not a meteroite I think it is a dinosaur dong from the jurassic period. Please study it closer and tell me of your findings? This looks like what we pass around in Intro Geology as an example of vesicular basalt, but it may be some other type of vesicular igneous rock, such as scoria or pumice. I’d need to see a more detailed view, and know how dense it is (does it seem heavy for its size, or does it float?). I’m a sedimentary geologist (I deal with “softer” rocks, like limestones, sandstones, shales, etc), so my knowledge of rocks like these is limited to what I was I taught years ago, but from what I remember of my igneous/metamorphic and planetary geology classes, I’m positive it’s not a meteorite. looks like coke, to me. They used to take coal and cook it down into coke, which burns hotter and ships easier, I guess. There were these old coke ovens in redstone CO, and I remember seeing stuff that looked like your picture. It was light and brittle. I’m with Mike H and voting that it’s of some sort of volcanic, igneous rock – most likely a vesicular basalt. Saw lots of that stuff underfoot when I lived in Hawaii, and this appears reminiscent of that. I’m voting vesicular basalt. Probably a fragment from the top of a flow. Good shape, though, will make an excellent paperweight or doorstop, depending upon the size. I play geologist, too, but haven’t gotten to do much hard rock work in my career, other than some well drilling in Eastern Washington. Most meteorites have more iron in them than earth rocks – even stony meteorites. Try sticking a magnet to it. If a magnet will stick to it, you have a stronger case for meteorite. However industrial slag may be magnetic so ymmv. Also kitchen magnets may not be strong enough – I have a stony-iron meteorite that is only weakly attractive to kitchen magnets, but a stronger magnet will stick to it nicely. 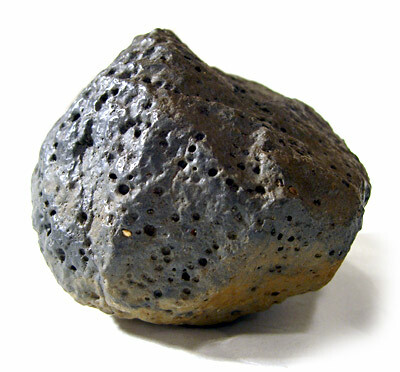 Meteorites are not porous like this, they are usually highly compacted objects (often from shock). looks like lava rock to me. there’s all kinds of stuff like that about 3 hrs north of me. Tests: is it light, or heavy? Is it magnetic, or not? It could be any number of things… if you ever see lightning strike the same wet sandy spot a couple of times rapidly in succession (happens occasionally at the beach) you’ll find you can dig up a nodule very similar to this at the touchdown spot. Looks to me like slag from mining. 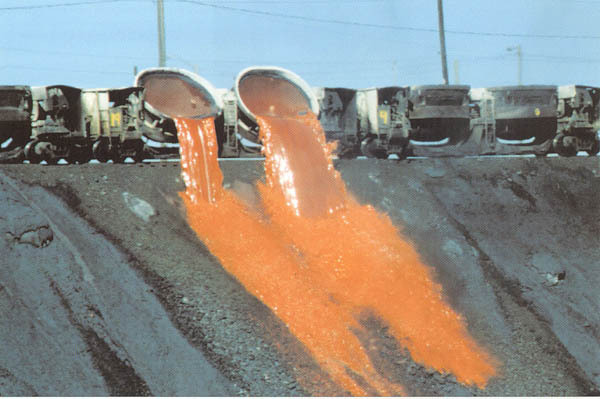 Alot of railroad lines use this by-product under the tracks. I too have found a rock like this and originally thought it may have been a meteorite. It somewhat looks like yours, but is much blacker and more polished than yours. But after much consideration over the years I have come to the conclusion that it is most likely volcanic basalt that was probably polished by being tumbled in a river for a length of time. My local university (as others sometimes do) have a “haul what you have found and have it identified day.” I have yet to make it up there yet, but plan to sometime. Stony meteeeorites have more of a “blackened crust” than a “molten slag” look to them. And often they will be cracked with the outer surface black and the inner cracked surface a light grey. Funny how you are so well educated, but still don’t understand when it is appropriate to use the word “YOU’RE.” Great job! a quick google search of his supposed society leaves me saddened… there seems to be no United States Geological Society on Extra-Terresterial Geologic Specimens. man… i was all set to become the treasurer. Try passing a strong magnet near it and see how it reacts. Most meteorites contain a fair amount of iron in them. A lot of folks are promoting the idea in their emails that this doggone rock’s igneous–lava, basalt, pumice (probably not)–or even cinders from burning coal. It looks a lot like all of ‘um. At the same time a good chunk of these folks are pretty adament about it not being a meteorite. I will point out that a couple of dozen igneous rocks from Mars have been found on Earth–which, if you work out the mechanics–coming in through the atmosphere and all that, means they are also meteorites. Being igneous not only doesn’t exclude a sample from being a meteorite, it improves the chances tremendously. The several smaller meteorites I’ve seen, have had tell-tale surface melt streaks or sorta bubble-like globules formed as the sample was heated by atmospheric friction until the surface became plastic enough to deform–sort of a backwards drip. I think that is a good, though not exclusive, characteristic of most meteorites. One option I didn’t see mentioned was a tectite. Looks sorta like one of those, too, doesn’t it? I agree with vesicular basalt idea. But really, you need to take the rock to someone who can test it for iron content. Also, density will tell that person a lot. Slag tends to be very light; basalt tends to be heavy. I’ll offer a picture of some steel slag that I have worked with. It is the first thing that came to my mind when seeing your pic. It had a porous structure, glassy bits, various colours. Yep – that’s a “clinker” as pointed out above. The house I grew up in was at one time heated by a coal furnace and those weird little rocks were pretty common. When I was a kid, I was pretty sure that my house had been built on a dormant volcano and that this was volcanic rock. That’s either a muffin top, or the flame from the Statue of Liberty at the end of Planet of the Apes. I wonder if it’s a lavarock that has fallen out of a backyard gas grill. Does it taste like BBQ chicken? didn’t you guys see ‘joe dirt’? what you have looks just like the prop in the movie. it’s a frozen piece of air plane poop. look for pea-nut inclusions. I have something that looks almost exactly like it, I picked it up near Lassen volcano in California, the burnt orange on the bottom is sulfur deposits (at least on the ones I have). Looks very much like lava to me. I found this on the Boing-Boing website. I saw your rock and it looks just like a piece of iron ore I have for some reason. And the pockmarks! The pockmarks all over make a good case for space. Falling through the atmosphere, you know it heats up and pocmarks form, right? I mean, if it’s a new addition to your property- wasn’t there before, what you have is a meteorite. And I would be very surprised if it wasn’t metallic. Iron ore looks almost exactly like that. And look at that orange on the bottom. Rust. So, it’s iron of course. The rust would mean a period of time exposed to the elements, but it could still be from space. Don’t waste time with a magnet, it wouldn’t stick to ore. Because the concentrations are low. Space ore. That’s what you’ve got. Metallic asteroids are rocky, with high concentrations of metal in the rock itself. So definitely natural iron, maybe from space. Lucky you! I must take issue with joemawlma attempt at correcting my use of the English language. I must apologize for my error, but English is not my native language as I am a native of Erudia; where we all speak Eruditely. Also, the correct spelling of your name would be ‘Yo-mama’. And for Brook – I am now appointing you Honored Treasurer, I will be depositing your monies as quickly as possible. And as for the photograph at the top of this page, after an extensive micro analysis using a photo-spectrometer I can tell you with assurance that this is indeed a meteorite most likely from an impact about 42 million years ago on Mars. Thank you. Thanks for that affirmation! With all these nay-sayers, I was beginning to doubt my meteorite. The only true way to know if it is a meteorite is to watch it fall from the sky. If you don’t see it fall or where it lands there is no way to tell if it is a meteorite or not based on the simple fact that it’s just a rock that has properties just like rocks that this planet makes. That’s why the only good place to find meteorites in the poles where there’s snow. If you find one on top of the snow or a glacier then it is reasonable to assume that it is a meteorite. I did a masters in geophysics and a degree in geology – as any decent geologist should know, just staring at a picture you can make many assumptions and come to the wrong conclusion. From observations what you can say is it appears to be a vesicular rock with a high ferritic content (iron) which is signified by the reddish/brown tinge at the base. It has a moderate-well rounded shape indicating it has undergone some sort of abrasion – these observations would fit in with the classification of a meterorite but just as much with a rock from a volcano that has been weathered by running through a river. It is quite important to know where you found it – if it was very far from a volcano then it could be a meteorite. The only real way to find out is take it to a lab where they can test it for high concentrations of iridium (v. common in meteorites) and other minerals. doesnt look like any meteorites that ive seen (work as a geologist in australia and have seen heaps). the shape is similar, though – the small ones are usually like a tear drop. if u wanna find a real one go out to your nearest desert onto a salt lake, they stick out like dogs balls.. This reminds me of Dan Brown’s Deception Point… like many comments here say, meteors are not very hard to detect after proper tests. Definitely not a meteorite, sorry. It certainly looks as if it was formed by the hardening of lava. Most meteorites look jagged and fragmented, and lack the smoothness of your rock. The holes and bubbles are the dead give away though. They are formed by the collection of gas when the magma is forming. Meteorites don’t develop holes like that, instead they have small concave sections, similar to thumbprints. It appears to be a chunk off the top of a lava flow or edge of some kind of igneous intrusion. 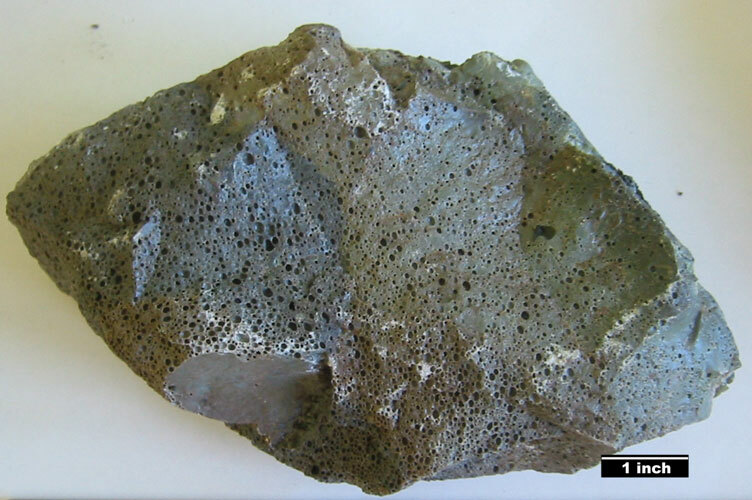 The vesicular texture generally arises from hot lava/magma coming into contact with water or waterlogged sediments, the steam generated produces the holes. The holes can be filled with later deposited minerals (zeolites usually) and are then known as amygdales (at least here in the UK). I am a geology graduate and have seen similar texture on fieldwork in Scotland. To quote my good friend the Reverend Jesse Jackson “KEEP HOPE ALIVE!” I have a whole bag of rust-dust covered examples of hemetite (sp?) ore which for years I believed were meteorites. They are very heavy and magnetic enough to convice me to keep them. An expert told me they were not meteorites, but offered no alternative suggestions. Ten years I lugged these around. I have grown quite fond of them and only recently identified them as hemetite. But I may be wrong. I picked them all up in those collections of worn stone that parking lots use as buffer zones. I figured that… oh bag it. I still have them. And yet a geologist friend of a friend still remembers enough to send me to this site (thanks). Keep that rock good buddy. Hold onto it for years. Someday when our sun dies in a big explosion all the stuff on earth will be sent hurling back into the dark cold expance, and then maybe, just maybe, you specimen will be wished upon by some freaky alien child as the stone lands in a flash and becomes a… dare I say it… a meteorite. Someplace…. Someday…. Keep it. Unless of course you break it open and find the aforementioned peanuit inclusions, then throw it away so fast it burns from the friction anyway. Don’t hang on to anything if you are waiting for it to become a coprolite. Thanks for the forum. I think I will go and check on my big bag of rusting rocks. And please, no one correct my grammer or spelling. I have a wall full of diplomas and degrees but I sent off a rough draft because I have five kids all clamoring for my attention, my coffee isn;t ready yet, and I have to go to work in five minutes. Not even enough time to caress my rocks. I’ve collected geology specimens and have had an interest in space all my life (40+ years). Having grown up in the mid-west too, I would say with little doubt that this is indeed a “clinker” – a leftover chunk of smelted material from a slagheap. These result from a number of processes: Iron smelting, blast furnaces, residue from blacksmiths, and quite a number of other industrial processes. If it mostly has a feel like rock, with the glassy glaze and the little pits all through it (empty from gas bubbles like pumice), it’s most assuredly one of these. They can be found especially near old industrial areas along the Mississippi, Chicago, Detroit, Cleveland & Pittsburgh (and other areas where there were steel mills for a very long time), and also from areas where glassmaking was prevalent (like West VA). It’s a side effect of superheating various rock materials and extracting minerals from it, or the waste parts that have been partly fused in those processes. They vary quite a bit depending on what process they resulted from but are mostly like this. Tektites, as I’ve seen mentioned a few times in all this are not really from space, yet are the result of extraterrestrial impacts – usually in sandy soils. Literally the heat and force of the impact will cause the silicon dioxide (glassy substances in most types of rocks, especially quartz) to literally become molten glass which often are elongated or droplike since they can “splatter” outward for many miles depending on the size of the strike and the amount of heat and resolidify in the air. Much is commercially available at rock shops and has come from finds in Indonesia, Australia & even Arizona. Most are from extremely old strikes (millions of years) and often do incorporate small amounts of the meteor as it disintegrated on impact. Most are from ancient strikes and are located when they erode from the soils. The most expensive are a greenish gem variety found in Poland & the Czech Republic, which is called moldavite (first found near Moldavia. I do have a piece of real nickel-iron meteor from a secondary strike in AZ (not the Meteor Crater National Monument) that is fairly well known as well as tektites from numerous locations throughout the world. They really look nothing like this. Go see your local Natural History museum or keep your eyes peeled for gem & mineral shows. Someone almost always has a few of several different kinds for sale if you’d love that ultimate paperweight! And for some of you that might be a set of genuine dino-dung bookends (prehistoric coprolites) instead. looks like something my local Bodyshop sells. Clearly, this is a variety of vitreous cheese, possibly Gouda, most likely expelled from the moon when it was hit by a meteor or comet untold eons ago. Astronomers believe cheese like this can tell us a lot about how the solar system was initally formed, and provide links to the very origins of our earth-moon system. Eat some of the cheese. Very shortly, you will experience what some astronomers and lunar geologists call the “lunar wind”. Does it have Chondrules?!?!?!? Does it have Chondrules?!?!?!? Does it have Chondrules?!?!?!? I don’t see any Chondrules. I’m favoringthe vesicular basalt diagnosis. Looks like volcanic to me. Collected some pumice of Vulcano in the Eolian islands floating around in the sea and that stuff is off white, porous,light (floats) and pretty hard. Unfortunately, that has no chance whatsoever of being a meteorite. It is undoubtedly a chunk of lava or hematite. Most people dont realize tht, although meteorites do tend to burn up as they enter the atmosphere, this melting simply boils away the durface of the meteorite, almost never leaving any bubbles, though indentations (often called thumb-prints because they look as if they could have been made by a person’s pushing their thumb into a ball of wet clay) are not uncommon. However, their surface is typically smooth, unless broken. A common misconception is that the meteorites themselves melt. This is entirely untrue. Although the exterior surface is essentially flowing off, it is being removed so quickly that the interior of the meteorite will stay at roughly its initial temperature (that it was in space — negative a couple hundred degrees) until it lands and absorbs heat from its surroundings. Hence, many meteorites that have been recovered just after they have fallen are covered in a frost. Hence also the lack of bubbles. Just google ‘meteorite’ in the image section. You should come up with a good idea of what to look for. Please get glasses experts. This almost certainly is a nice juicy strawberry dipped in melted marshmallow, and slowly and almost perfectly roasted over a charcoal barbque, even has a strawberry seed, or perhaps a flax seed, or perhaps a sesame seed glued on. I am truly afraid for the fate of our world if any of you actual experts actually believe that the picture of this fruit actually is a picture of an actual meteorite. It looks kind of tasty, never tried one before. Do any of you actually know where I could get a meteorite scientifically identified in British Columbia, Canada? Actually actively waiting for a reply. Send it to the Smithsonian. They will identify it for you! I have a piece of what my uncle says was from a falling star. It was one of several pieces he had and gave it to me about 40 years ago. It is about 3 inches by 3 inches and 1 1/2 inches thick and greenish tinge in colour and cauliflower like surface. What is it?